The $55 million figure was released by Oconee County Board of Commissioners Chairman Melvin Davis on Thursday night at a discussion called by citizens interested in advocating for continued funding for farmland protection from SPLOST. The $15 or $20 million increase in projected revenue has no impact on actual spending, which is based solely on money received. The increase in projections, however, makes it easier for the county to add more projects to the SPLOST ballot language, including at least some funding for a $25 million courthouse or judicial facility. Oconee County citizens will get their first chance to tell about their interests in SPLOST projects on Monday night in a meeting starting at 6 p.m. at the Civic Center on Hog Mountain Road. 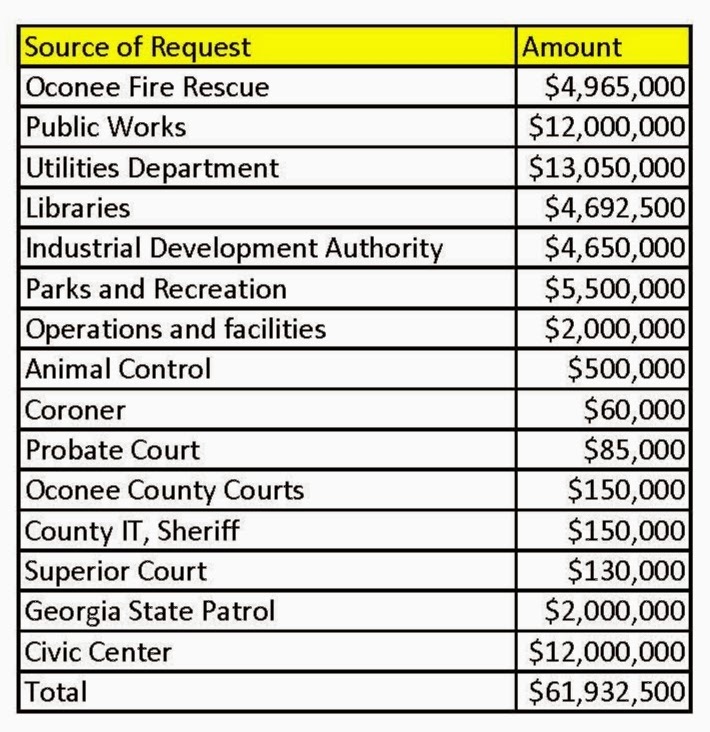 Oconee County Finance Director Wes Geddings has told the Commissioners in a memo he wrote on Dec. 17 that he has $114 million in requests even before the meeting starts. Geddings told me after the Board of Commissioners meeting on Tuesday night that he included $25 million for the courthouse or judicial facility in that amount. He said he also included money for debt retirement, money for projects requested by each of the four cities in the county, and all formal requests he has received from county elected officials and department heads. Geddings also told the Commissioners that they would have to approve a SPLOST for $137 million–or considerably more than twice the $55 million figure used by Davis–to cover these $114 million in requests. This difference between $114 and $137 exists because the county actually plans for a shortfall in collections of about 20 percent when it budgets for SPLOST projects. Geddings would not release the details of his list, saying it was not an official document. 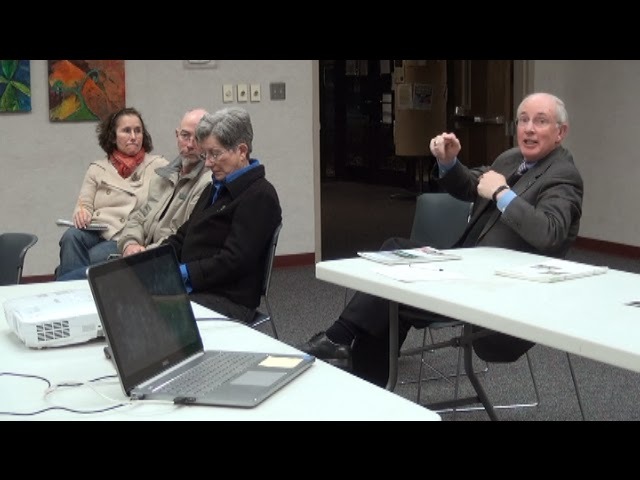 Davis told the gathering at the library on Thursday night that the list will be made available to citizens on Monday. County Administrative Office Jeff Benko told me in an email message on Thursday that he will present all of the requests made by county officials and department heads to the public and the Commissioners on Monday night. Benko said he will have department heads present to answer questions. Citizens will get to make comments after he makes his presentation, Benko said. Gedding gave me copies of the actual requests he received from department heads and county officials on Dec. 19 in response to an open records request I had filed. The total amount formally requested was $61.9 million, based on high estimates given by those submitting the paperwork. No formal request for funding for the courthouse was submitted, though Geddings included it in his total of $114 million. Geddings told me on Tuesday night that he had not explicitly included funding for a continuation of SPLOST funding for farmland protection in his tally. The current SPLOST includes $0.5 million in funds for farmland protection, and the meeting on Thursday night was designed to show what the county has achieved over the years with its farmland protection program. Russ Page, local farmland advocate, and Laura Hall, conservation director at the Athens Land Trust, called the meeting, but neither was able to attend because of illnesses. Nancy Stangle, emerita director of the Athens Land Trust, ran the meeting, attended by 18 people and held at the library in Watkinsville. Farmer Sam Mitchell from near Farmington told the group why he decided to submit his farm for protection under the program and of the importance of the farmland protection program. Stangle asked me to step in for Page and discuss the process that will be followed by the Board of Commissioners in selecting projects for SPLOST 2015. I summarized my blog report on Jan. 5 and emphasized that the process is political. Commissioners are under pressure from the department heads and elected officials to fund the projects they have put forward. At the same time, they want to select projects that the public will support in the actual SPLOST referendum. Page made the pitch for inclusion of farmland protection for the current 2009 SPLOST, and he was the only citizen who proposed a project actually included in the referendum. Davis made his comment about the $55 million projection during my comments on the SPLOST process. Following the meeting, he told me he had been in contact with legislators and expects a simple solution to a problem confronting the county. State law sets forth a timetable and set of procedures for getting SPLOST referendums on the ballot and mandates the opportunities for citizen and city input that will be afforded by the meeting on Monday night and a second on Feb. 10. That second meeting also will start at 6 p.m. and also will be held at the Civic Center. Special elections held in conjunction with a state-wide general primary, which is what the May 20 election will be, must be called at least 90 days prior to the date of such a primary, according to state law. When the county began planning for SPLOST 2015, it had assumed the state’s primary would be in July. But, in response to a federal court decision, the primary is to be moved to May 20. Davis said he believes legislators will not only move the primary to May from July when they meet this month but also make a one-time exemption to the SPLOST timetable, allowing the Oconee County Commissioners to put the issue on the ballot at their March 4 meeting. The county projected that its 2004 SPLOST, which ran five years, would produce $25 million. In the end, the county collected closer to $26 million. The county projected the current SPLOST would generate an average of $6.7 per year, but the economic collapse has shown that projection to be overly optimistic. The $55 million projection for 2015 SPLOST–for an average of more than $9 million per year--assumes tremendous growth in commercial activity in the county. Epps Bridge Centre, in the triangle between SR Loop10, Epps Bridge Parkway and the Oconee Connector, is only now coming online, making precise long-term estimates of revenue from that mall difficult to make. Put the money on debt and lower taxes! Melvin and Scott Berry really, really want a new courthouse. That's why Melvin's promoting higher SPLOST revenues. SPLOST seems to be the only way to provide for infrastructure needs since we don't like to pay other taxes. I just hope they spend the money as directed and not let it sit around as they have sometimes done.